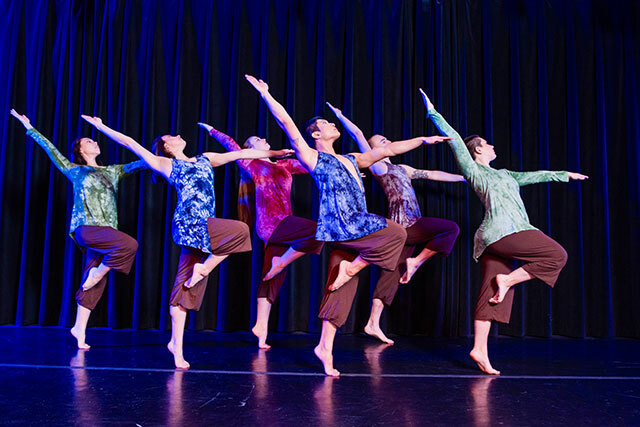 The Theatre, Film, & Dance Department at Humboldt State University presents Surrenderings, a dance concert created by students and faculty, in the Gist Hall Theatre on campus for two weekends in April. The Earth is Where We Make Our Stand, by Jandy BergmannThis production contains a diverse selection of styles ranging from contemporary to tap, and from hip-hop to Mexican Folklorico. Thematic content is just as diverse, with dances inspired by cultural identity, biology, climate change, human tenderness, celebrations from Sinaloa, Mexico, and the weave of African and American culture. Surrenderings will be enjoyed by audiences of all ages. Danh Tinh is a spoken word contemporary solo choreographed and performed by Gabby Connors, a Dance Studies major. Connors explains that she was inspired by “individuals with multicultural heritage that struggle to find an identity that feels right.” Danh Tinh, is a compelling dance of personal story, and it is informed by Connor’s poignant reflections into her own Vietnamese-American heritage. Jandy Bergmann, dance faculty, is the choreographer of The Earth is Where We Make Our Stand, a modern dance inspired by the issue of climate change and global warming. Bergmann’s lush and organic movements were generated by the seven dancers and then crafted together with Bergmann’s artful eye for composition. This dance features a sound score of music, text, and poetry, compiled by Bergmann and sound designer Pablo Midence. In total, Surrenderings features 11 dances, five faculty choreographers, six student choreographers, 42 dancers, and a special performance by the HSU Dance Program’s Mexican Folklorico Club (El Ballet de Folklórico de Humboldt). The concert dancers are mostly HSU students, but some talented community members will also grace the stage. Surrenderings opens in the intimate Gist Hall Theatre on April 5 and continues April 6, 11, 12, 13, at 7:30pm. There will also be one matinee show on April 14 at 2 p.m. General admission is $10 and $8 for students and seniors. Limited free seating for HSU students is available. We recommend you arrive early—there is a good chance shows will sell out due to limited seating. Lot parking is free on weekends. Tickets are available online, at the door, or by calling 707.826.3928. For more information, call the HSU Theatre, Film, & Dance Department at 707.826.3566.